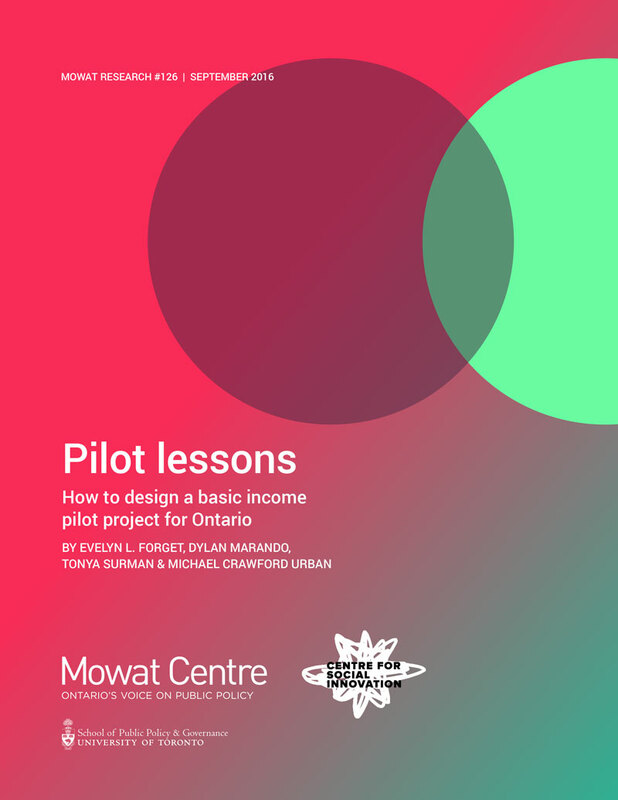 This report makes a series of recommendations for how to design the Basic Income (BI) pilot that the Government of Ontario has proposed to conduct. In its 2016 Budget, the government of Ontario committed to designing a basic income pilot project. The idea of basic income is not new, but in the face of a radically different labour market and new technological disruption the concept is once again on the radar of governments around the world. Our latest paper takes a look at the research from a series of basic income experiments conducted in the U.S. and Canada in the 1960s and ‘70s. It discusses the lessons learned from these projects as well as several more recent experiments in low and medium income countries. Taking into account recent changes to the structure of the labour market and the impending effects of technology and automation on jobs, Pilot Lessons explores how a basic income could impact entrepreneurship, innovation and society’s relationship to work. Combining these analyses of past experiments and the current context, the report makes recommendations on how Ontario could best design a basic income pilot project. In its 2016 budget, the Government of Ontario committed to conducting a basic income pilot project as part of its preparations for comprehensive reform of its social assistance programs. Taking particular note of “today’s dynamic labour market” and a need to “strengthen the attachment to the labour force”, the government pledged to work with researchers during policy development.1 This paper represents a response to this pledge and an attempt by the authors to contribute to this important discussion. The idea of a basic income is not a new one and different forms of the idea have been supported by an impressive diversity of thinkers, activists and policymakers ranging from 18th century revolutionary Thomas Paine, to civil rights activist Martin Luther King Jr, to United States President Richard Nixon. Moreover, numerous basic income experiments and pilot projects of various designs have already been run in a number of countries providing researchers with significant information and data. Similarly, just as it is important to remember that basic income has a history, it is also essential to recognize that the recent surge in interest in the subject is occurring in a specific context, namely, one in which our connection to and experience of work is changing. It is not an exaggeration to say that recent and incipient technological advances in areas like artificial intelligence, as well as concerns over growing income inequality and the arrival of the so-called “gig economy”, have helped to launch basic income back into the headlines. Leveraging existing expertise and knowledge of the earlier basic income experiments to identify how the lessons learned from these experiments can be integrated into the design and implementation of any new basic income pilot. Illuminating the potential impact of a basic income on entrepreneurship and innovation – areas which have not previously formed a major focus in experimental basic income research – and offering ideas on how the design of a basic income pilot could be optimized in this regard. With these two goals in mind, the rest of this report has been organized into four chapters.Chapter 2 provides a brief overview of basic income – both of the concept and its history – and draws out the critical lessons from these past experiences for the design of future basic income experiments. Chapter 3 focuses on the current context in which the proposed pilot will occur by tracing the emerging contours of the new economy and its associated challenges and opportunities, especially as these relate to innovation and entrepreneurship. Chapter 4 then provides a series of recommendations for how to design Ontario’s pilot based on the analysis laid out in Chapters 2 and 3. The final Conclusion chapter summarizes the key themes discussed throughout this report. This report is informed by extensive comparative research, the authors’ varied experiences in the policy process, as well as consultations with entrepreneurs, particularly social entrepreneurs. Learning from past pilots, while also taking into account Ontario’s current economic conditions, the aim of this report is to contribute to a high-impact policy experiment that will make government programming more responsive to the needs of the labour force, especially those in the most precarious positions.